In the digital age it is easier than ever to enjoy your favorite music. No matter where you are your music can be with you. You may be at the beach, on your back patio grilling up some burgers or lounging in your entertainment room with your family. Wireless AirPlay speakers have revolutionized the way that music can be enjoyed. AirPlay speakers are small, portable and offer high-quality listening without the added burden of a full speaker setup. They range from small single devices to ones that can be connected to form a full surround sound setup. Whatever you are looking for can be found. Continue reading to discover the best AirPlay speakers on the market and begin your adventure into wireless sound. Polk Audio is a household name when it comes to home speaker systems. They have produced some of the most popular audio devices since their inception in 1972. Known for their bookshelf speakers and car audio systems Polk Audio has established themselves as a leading figure in the consumer audio field. As the years have progressed Polk Audio has adapted to fit the modern sense of style and home listening. Polk Audio now boasts an impressive roster of wireless speakers that are set to raise the bar because of the thought and passion behind their speakers. The AM6119-A Wireless Woodbourne Speaker is a top product by Polk Audio. It features a durable build, elegant design and powerful acoustic properties. This box is sure to fit into your environment without being an eyesore like so many other products. The internals are well-made. It is an artisan product for the average listener. Even the audiophile would more than likely approve the Woodbourne as a being a high-quality speaker. This speaker system is powered by a 4-channel amplifier. There are two 70 Watt midwoofers and two 20 Watt tweeters installed. This ensures that your room will be filled with sound despite the small size of the speakers. The amplifier provides plenty of sound output without the need for external devices to boost the output. 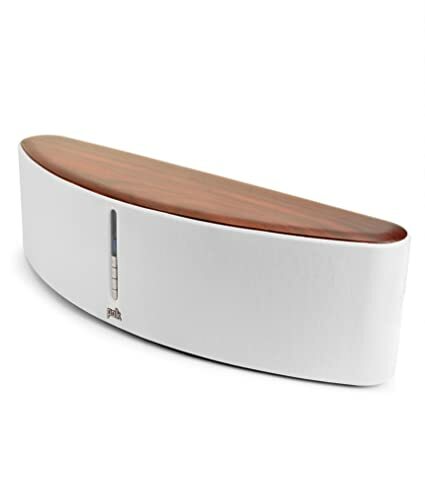 The frequency response on the Polk Audio Woodbourne is 36Hz to 22kHz. You can enjoy a multitude of different styles of music on these speakers without sacrificing frequency response or sound quality. Genres from classical to hard rock will sound natural. The lower frequencies are said to be clear and round. That can be hard to find in lower-end models. If bass is something you want to hear go with this set. It will not disappoint. This device weighs in at just under 18 pounds and the dimensions are 24.1 x 6.9 x 7 inches. It is on the small side but carries enough weight to guarantee its longevity through many uses. One of the impressions that you can expect to have when handling this device for the first time is that it is of remarkable build quality. There is a solid feeling to the speakers that is difficult to find in lesser brands. There are multiple connectivity options included in the AM6119-A. You can choose between USB, 3.5mm Stereo, Optical, Apt-X Bluetooth, Ethernet and AirPlay. All of your preferred methods of playing music are covered. This means that the Apple user as well as the Android or non-conventional user will find a home with the AM6119. The wireless capabilities are the hallmark of this box. It has great range, stable connectivity and supports many different devices. It is not important if you use Android, Apple or anything in between. The Woodbourne by Polk Audio will connect to it. This makes this system ideal for any situation where you want a full room of sound but do not want to clutter your environment with massive towers and subwoofers. This model can be found for as low as $250 at most online retailers. This is much less than the retail value of $700 from the manufacturer and will not bust your bank. For the price it is hard to justify going with any other model in the portable speaker field. Not only are you getting the Polk Audio name but you are getting an amazing set of wireless speakers that will change how you hear music. Customers who purchased this device have said that it this speaker gives a round sound. The bass is full, the mids are balanced and the treble is not unpleasant like it might be in cheaper speakers. Stereo separation in this device is perfect. You will be hard pressed to find that quality in a lesser model. Polk Audio has delivered once more a product that is destined to surpass others in the home audio wireless speaker market. The AM6119-A focuses on crisp sound and elegant craftsmanship. It does not fall short on either of these ideals. It exceeds all expectations and will change the way that you listen to your favorite songs. Sonos is another brand that, like Polk Audio, is known in audiophile circles around the globe for delivering the listener a fine listening experience. 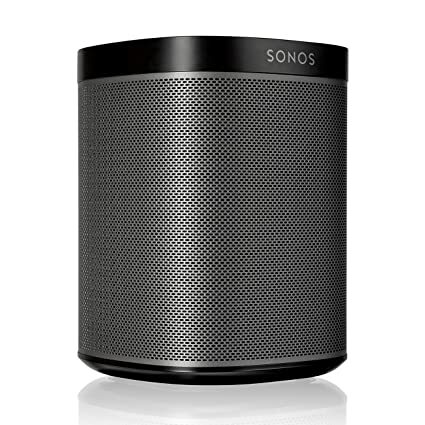 Sonos creates speakers that are built to last, blend in and fill your space with great sound. Their PLAY:1 speaker is the clear winner for the Silver Pick and Runner-Up spot on this list. The build of this speaker is impressive. The dimensions are 4.7 x 4.7 x 6.4 inches, and it weighs just 4.1 pounds. It is small and incredibly powerful for its size. Due to its size it is considered to be modular. You can choose to add additional Sonos products to create a surround sound system that integrates well into the design of the space. It is powered by two digital amplifiers that are tuned to perfection. It has a single tweeter and midwoofer. This setup brings a wide range of frequency response that is sure to cover your favorite styles of music. The compact internal design is just enough to fill any room. You can also choose to stream music from various sources. For example, you can use Soundcloud, Spotify, Pandora or Deezer to send music through the PLAY:1. This is a great feature that is not unique to the PLAY:1 but is executed with ease. You will have limitless music options. Internet radio is also supported so you can enjoy your favorite podcast or online radio show without interruption. Playlists can be made if you wish to have a selection of songs ready to go. Platforms that are supported are iTunes, WinAmp, Windows Media Player and Rhapsody. This is great for those parties where you do not want to fool with the music the entire night. Simply have your playlist ready to go and forget about it. Playback modes for the PLAY:1 are shuffle, repeat and crossfade. This gives you some variety in your listening choices. Other devices tend to overlook the importance of having playback options. Sonos kept that in mind when designing this product and the success is evident. The wireless connectivity uses your home’s WiFI. The other option is to use SonosNet. SonosNet is a wireless mesh network that is only used by your Sonos device. This can help lower the burden from your home’s Internet connection if it is not the strongest. Pricing is fair for a PLAY:1 Compact Smart Speaker. You can find them online for around $200. If you choose to buy more than one you will still be saving yourself money in the long run considering the high costs of massive speaker systems. Having two running together leads to an awesome and powerful stereo system. For the price and quality you would be doing yourself – and your ears – a favor by choosing this model. Philips has been producing home audio systems since the 1960s. Their inventory includes wireless speakers, hi-fi systems, PC speakers and surround sound devices. Every aspect of Philips home audio components screams quality. They have built a reputation for great sounding speakers at affordable prices. The AD7000W FIdelio SoundAvia is no different. The AD7000W is a wireless speaker that boasts an impressive set of features that make it a great Bronze product. While it may not be as impressive as the Gold or Silver products it is still in a competitive position. This one is perfect if you enjoy background music or do not care for audiophile quality in your sound. It weighs in at 4.6 pounds and comes in a sleak black design. It has a modern look that is sure to impress. This device is powered with a 100-240 VAC power supply so you can rest easy knowing that you will never have to deal with the hassle that is battery replacement. Simply plug in and begin listening to your favorite tunes. The speaker is a 10 Watt powerhouse. Despite it’s smaller size this speaker pushes sound all around your room leading to a full sound. This makes it great for parties, game nights or simply for your personal listening. Expect to find plenty of enjoyment after plugging this device in. 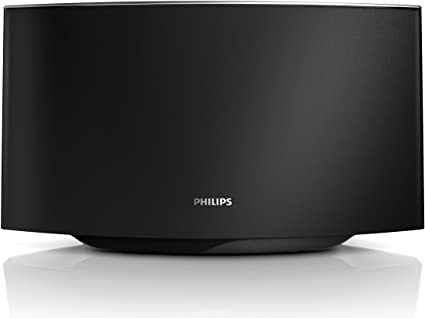 The main feature of the Philips Fidelio series is the AirPlay streaming technology. This allows you to stream music from your iPhone, iPad, iPod or your iTunes library on your computer. You can expect crisp quality without the need for cables. An AUX input is available if you would like to plug your device directly into the box. No matter the device it will find a comfortable home here. Another reason to consider this device is the fact that it can charge your Apple device via USB. This makes charging and listening at the same time possible. You will not have to worry about your device dying in the middle of a song. That can ruin the mood in an instant. Thankfully that will never happen when your device is safely charging. Also included is the free Fidelio music app for iPad Touch, iPhone or iPad. This brings you over 7,000 free internet radio stations to choose from. Every genre you can think of is available and will bring your hours upon hours of entertainment. You can also share your favorites to Facebook or Twitter to show your friends what you are currently listening to. Users tend to agree that setting up this device is simple. No time will be lost between opening the box to streaming music. The connectivity is reported to work without issues, and the feel of the speaker is hefty. It is not a cheap product. For the price of $94.00 it is hard to find better. Overall the Philips AD7000W/37 Fidelio SoundAvia is a solid buy that you cannot go wrong with. It has enough features to feel versatile without bogging your experience down. A budget product is oftentimes considered to be cheap, poorly made and leaves you unfulfilled. The home audio market is saturated to the point of bursting with low-end products. Manufacturers tend to forget that sound quality is the number one priority when developing their products. With the iHome iW1 wireless speaker, however, that is not the case. This Budget Pick deserves to be ranked among the best for the price, features and build. The sound is sharp and the overall feel of this one is solid. 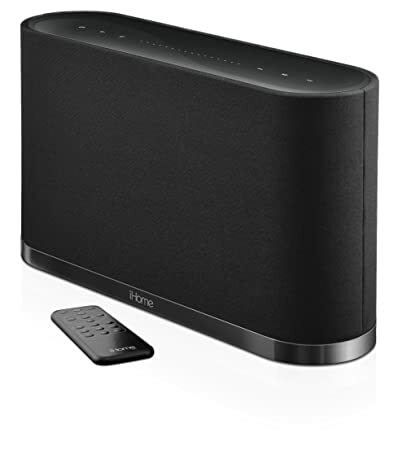 iHome is a popular user brand in the wireless speaker market. Their products are known to be affordable yet efficient. Superior audio quality is never sacrificed for cheap parts or gimmicks. Users of this device have said that everything about it is minimal and sleek. No unnecessary frills are added. If you enjoy clean designs then this product will fit right in your home. The dimensions are 17.7 x 11 x 6.9 inches. It will fit in most practical places. It is neither too big nor too tiny. The speaker system is a cool rectangular shape and it comes in a modern black. It is a heavy device at 9 pounds. Also included is a remote control, a charging base, a USB sync cable and a 100-240 VAC power adapter. AirPlay is what is used to stream wirelessly so you do need an Apple device. However, the connections are reported to be flawless. You can charge your iPhone or iPod on the iHome. This is a nice feature that keeps your charged up whenever you want to listen to music. A 3.5mm AUX input is available if you wish to use another device with these speakers. You can find an iHome iW1 for just $49.95 making it the best budget pick. Cost is something to consider before all other aspects of speaker purchasing. It is not difficult to go overboard with your spending. Speakers can be found from under $50.00 to over $20,000.00. It is vital to think about what you have to spend and how far you are willing to go. There are plenty of affordable options on the market that keep your bank full. You can get an amazing, clear and crisp pair of wireless speakers for under $500. It is not so important to own the most expensive wireless speakers available because they are intended to be portable and easy to take with you unlike a built-in home audio system. Consider your intended uses and spend wisely. Remember that many wireless speakers can be a stepping stone into a full home audio setup if that is your goal! The best part about wireless speakers is that they are usually quite small. You can take them with you on vacations, you can move them around your home and you can bring them outside for those summer barbecues near the pool. You want a device that is small but not too small. A good size is under 3 feet long and about 6 inches tall, plus or minus. Any larger and you might as well install a permanent sound system because you will not enjoy lugging your speakers around. As far as weight is concerned consider how much you plan to move the speakers throughout your home. If you want maximum versatility choose a device that is under 8 pounds. Any heavier and you will regret not going lighter. If it will be a more permanent fixture the 10 pound and up region is sufficient. Keep in mind that wireless speakers are meant to be portable. Do not fall into the marketing trap of spending more money for a bigger wireless system that is a pain to setup in different spots. Many wireless speaker systems support multiple devices, but there are also those that only support Apple devices using AirPlay technology. This is perfect if you are a dedicated Apple product disciple iPhone but not if you use an Android or different device. It may be a smart idea to make sure that you can connect your device with an auxiliary cable if wireless streaming is not compatible. Other models have USB cable support, AUX inputs and other options included. Look out for an affordable box that can use many types of sound sources. Try not to limit your options because you never know when you will have (or not have) a certain type of device at hand! Most wireless speakers you will see include a power supply. They are almost always 100-250 VAC. This makes the need for batteries less likely. That aspect is something that will save you time, frustration and a little money. Power supplies tend to last a long time. In the event that one does go out an extra power supplies can be found almost anywhere for little cost. A great product is one that has a backup if the power supply dies. Keep your eyes open for those products that can take batteries. On the flip side if the product only offers batteries at first glance, read further to discover if it also includes a power supply. The last thing that you want is to be left without music when you need it most. Let’s be honest: some speakers are an absolute eyesore. Many home audio systems look like strange alien artifacts crawling up your wall. If that is your thing go ahead, but for most users a compact and smart design is better when it comes to wireless speakers. Thankfully most wireless speaker systems on the market today are compact. They tend to have a minimal design to them. The aesthetic is pleasing and will not hurt your eyes after a short time spend viewing them. You want a product that is unassuming as you will want to be taking your speakers from room to room without ruining your home decor. You want the speaker to blend in just enough to keep the focus on the music, conversation and atmosphere rather than the little black box on your bookshelf. Black is the usual color of choice. You can find different options available from some manufacturers if you want something with more pop. Speaker acquisition can either be a pleasant journey or an absolute nightmare depending on the choices that you make. There are thousands of options to choose from nowadays. Each brand is trying it’s best to sell you their offering. Oftentimes that can be nothing short of intimidating. Doing adequate research about what you want is essential to making the best decision. Brands exist that will save you money and setup time. Others will drain your bank account faster than you can imagine. Be diligent in your research. Know what is out there, know what you need and do not be afraid to ask questions before you make a purchase. See what other people have to say about the product you are interested in. Look for high ratings and kind words rather. There are many audio magazines and websites such as Digital Trends that review all the latest in audio technology. You can find reviews and comments on your product of choice. Stay educated on what is happening in the field of home audio. You will be surprised how much knowledge can shape your purchasing! Wireless speakers can truly change the way that you listen to music. They are a fun addition to many situations. You will find yourself listening to much more music whenever you have the ability to do it in high quality no matter where you happen to be in your home. With music available whenever and wherever you want it you will be thanking yourself for choosing a wireless device. Most importantly remember to enjoy yourself. Music is one of the most enjoyable things on that one can experience. Do not sell yourself short in how you hear it. Choose a wireless speaker system that will maximize your listening pleasure.